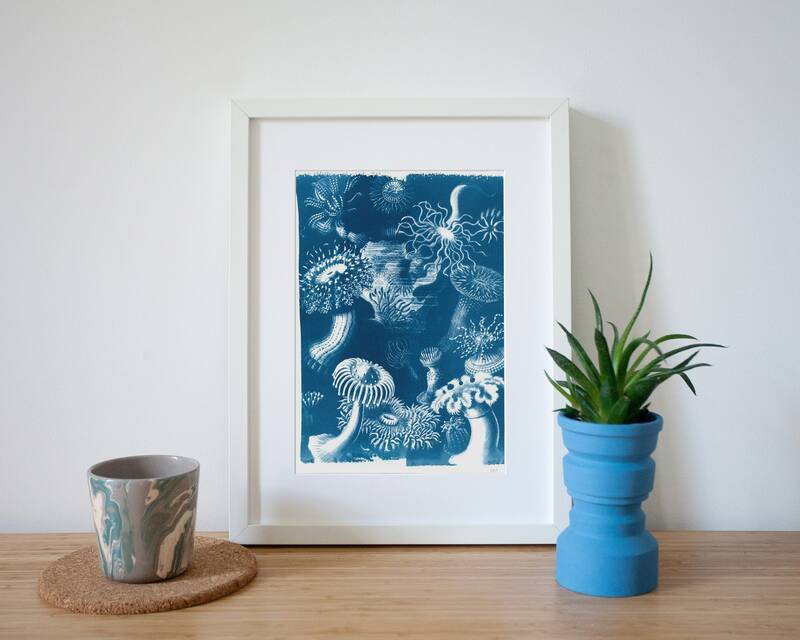 Limited edition cyanotype print, handmade and printed under the Barcelona sun! 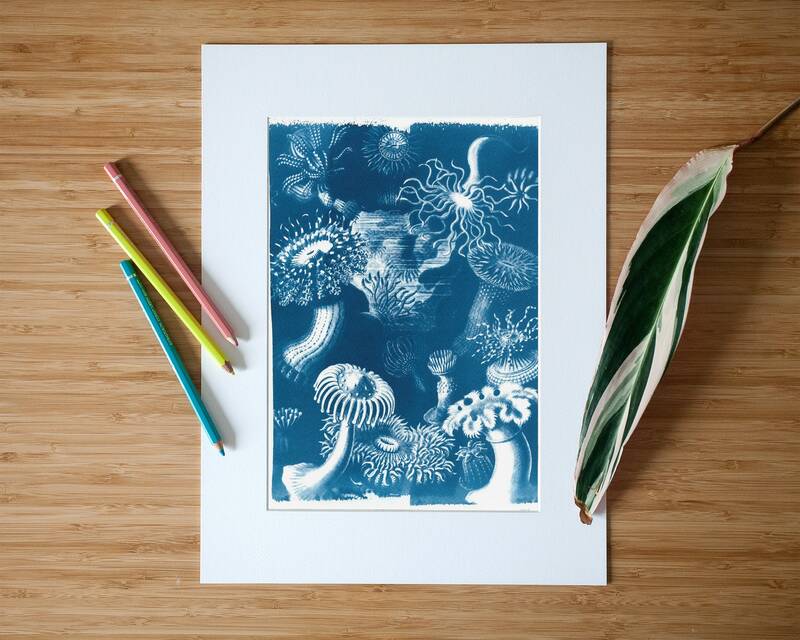 This is a handmade limited edition (only 250 samples) of a cyanotype print. This beautiful scene, originally drawn by Ernst Haeckel, is a vintage botanical drawing showing different types of fungus. Measurements: A4 (about 8.2 in x 11.7 in) size. All prints are made on high-quality Italian watercolor paper. 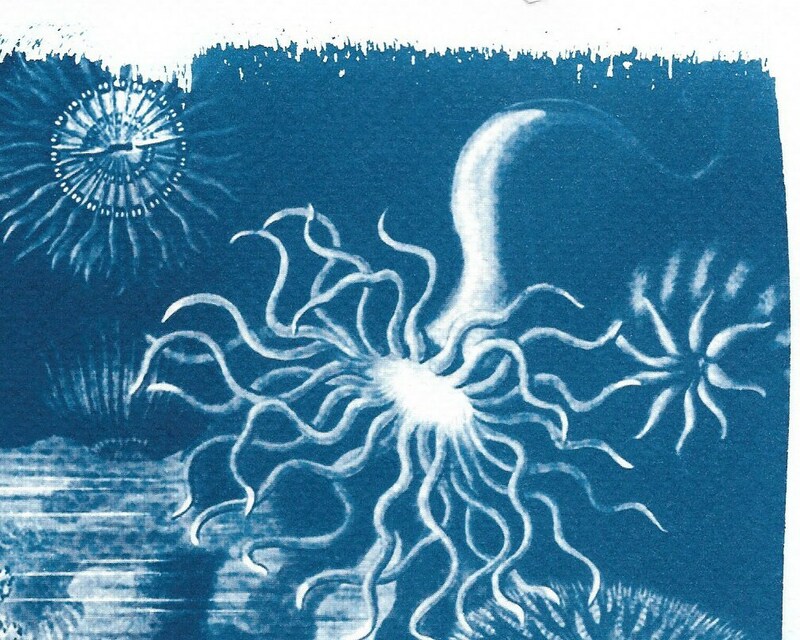 The cyanotype (a.k.a. sun-print) process is one of the oldest in the history of photography, and during this digital revolution that we are experiencing, we feel the need to look back at a craft that is handmade, analogue, and using an all-natural light source: the sun. 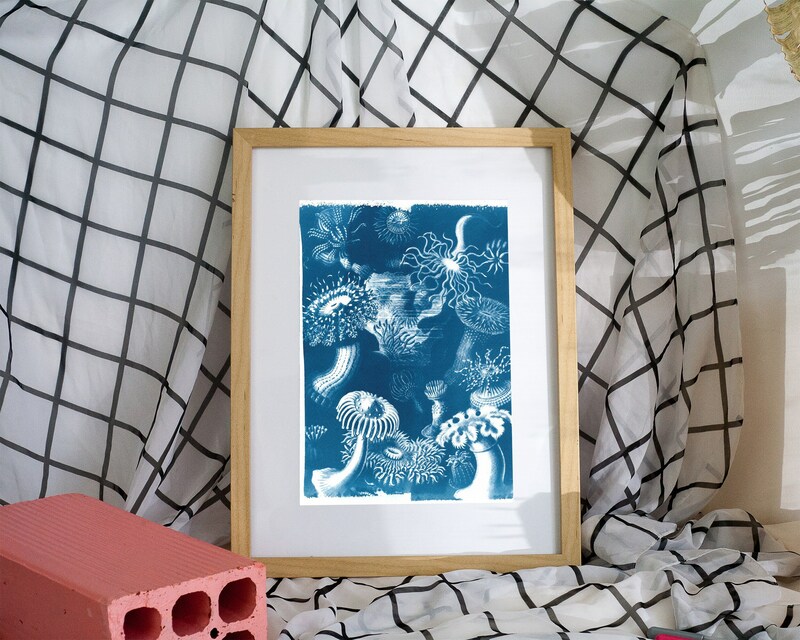 Our cyanotypes are made by coating high-quality watercolor paper with a light-sensitive emulsion, to then be exposed in direct sunlight for several minutes using a photo negative to get the best image quality. The print is then washed and fixed, to stop the chemical reaction and prevent fading. What you get is an amazing, Prussian blue image, with absolutely no ink involved. 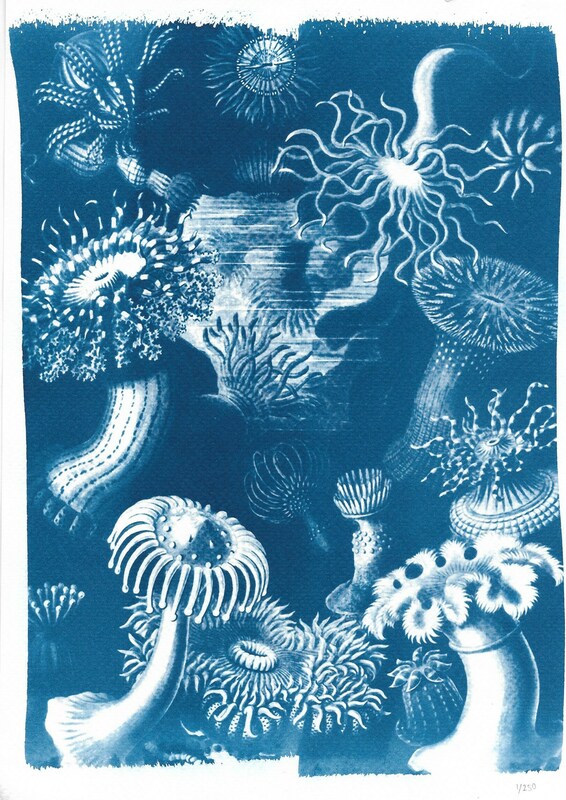 Since each print is handmade, tones may vary slightly- the beauty of cyanotypes is that each print is unique. We specialize in custom orders! If you have a photograph that you want to be printed as a cyanotype, please get in touch with us and we can work out the details together. Generally, we would need a high-resolution jpeg of your image and we can take it from there. We can make a number of custom size prints, all the way from A6 (that's about the size of a 4x6 inch photograph) up to A1 (24x33 inches). Also, pricing changes for multiples of the same image, so if you want 5 to 10 to 100 prints of the same image, let's say for wedding invitations, business cards, or personalized Christmas cards, the price will go down. However, we require a minimum purchase of 3 copies per custom order. 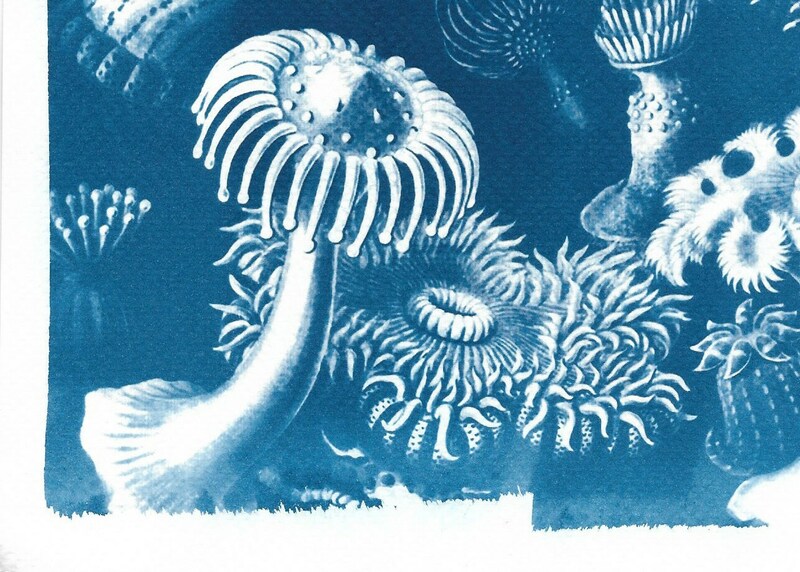 Since cyanotypes are one of the oldest photographic prints known, they must be stored properly. 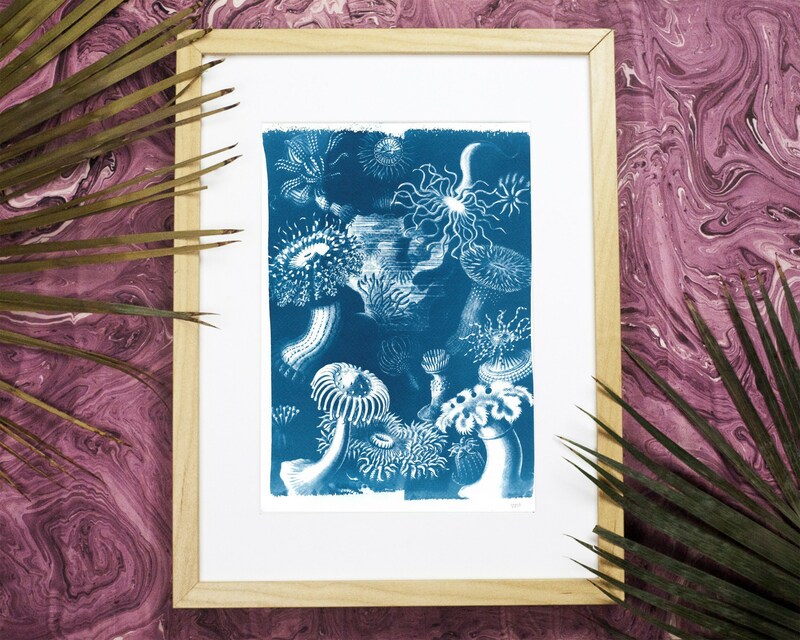 Cyanotypes involve an intricate process with light-sensitive chemicals and high-quality papers to get the best image quality possible, so they are very different to regular inkjet prints. Although image quality is quite stable, there may be some fading if exposed to direct sunlight for long periods of time, and placed in extremely humid or acidic environments. For your print to last a lifetime, which it can, it would be best to put it in a glass or plastic frame, and try to keep it indoors, away from direct UV light- indirect light is fine! If you have any more questions, please ask! We offer discounts for the purchase of multiple prints, whether it be the same image or a series of images. Please contact us for specific details about your order. Remember that each cyanotype print is unique, since they are all hand-made and exposed in direct sunlight, so there may be subtle variations in tone and texture. When expecting multiple prints of the same image, don't expect them to all be exactly the same, there may be small variations- that's the beauty!